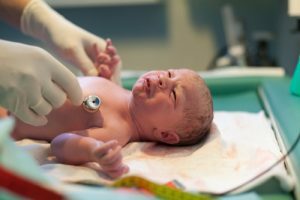 What Is a Birth Asphyxia Condition? Birth asphyxia condition, also known as neonatal or perinatal asphyxia, is caused when a newborn baby doesn’t get enough oxygen at the time of birth or just after birth. This oxygen deprivation can lead to a build-up of acids in the cells and cause temporary or permanent physical damage to the infant’s brain. Birth asphyxia occurs in about four out of every 1,000 full-term births. It is the responsibility of the attending medical staff to properly care for the mother and infant before, during, and after delivery. Failure to act immediately or failure to diagnose a complication and treat it can have devastating results. If medical staff overlooks the symptoms of birth asphyxia, an infant could be left with an irreversible lifelong brain injury. Can Birth Asphyxia Be Treated? If your baby has mild asphyxia, he or she will be given breathing support and will be closely monitored until he or she is able to breathe well on their own. Babies with more serious asphyxia may need treatments such as brain cooling, respiratory therapy, a breathing machine, and/or medicine to control blood pressure. Can Birth Asphyxia Be Prevented? It can be difficult to predict or prevent birth asphyxia. However, mothers who are given proper prenatal care and identified as high-risk could be given extra oxygen before delivery or scheduled for a C-section to help minimize complications. Prompt treatment should always be available for infants after birth to minimize any potentially damaging effects of decreased oxygen. Assisted ventilation and medications to support breathing and blood pressure are just some of the ways to minimize the negative side effects of birth asphyxia. Ultimately, birth injuries come down to the abilities and knowledge of the medical staff treating the mother and infant. Doctors and nurses must be prepared for any possibility, even when a mother has had a complication-free pregnancy. How Can Thurswell Law Help? If your child has been diagnosed with a birth injury as a direct result of birth asphyxia condition, contact Thurswell Law. Our leading birth asphyxia attorneys have the experience to get justice for you and your child by fighting hospitals and insurance companies on your behalf. We have been assisting families in Michigan since 1968, and we never charge a fee unless we recover money for your child. Call us today for a free consultation at (248) 354-2222 .